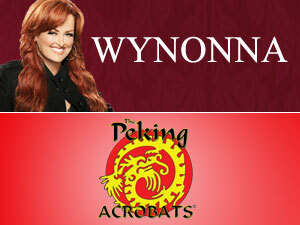 Home > News > News > Wynonna & The Peking Acrobats! Wynonna & The Peking Acrobats! Coming this Thursday, March 1, Wynonna & the Big Noise make their AMT debut. Wynonna’s journey as one half of legendary country duo The Judds, with her mother Naomi, provides one of the most fascinating stories in country music history. Wynonna and Naomi rose to superstardom in the early ‘80s on the strength of chart toppers like “Mama He’s Crazy,” “Why Not Me,” and “Grandpa (Tell Me ‘Bout the Good Old Days),” and picked up multiple Grammy, CMA and ACM awards along the way. Since striking out on her own in the early ‘90s, Wynonna has gone on to not only be a tremendously successful solo artist, but she’s also a New York Times bestselling author thanks to her candid 2005 memoir Coming Home to Myself. Recently, Wynonna recorded the original song “Whatever Brings You Back” for the just released Navy SEAL action-thriller Act of Valor. Wynonna & The Big Noise – Thursday, March 1 at 8:00 p.m. – Click here to buy tickets now! On Saturday, March 3, bring your family to share in the wonder of The Peking Acrobats. Since their debut in 1986, the Peking Acrobats have redefined audience perceptions of Chinese acrobatics. They perform daring maneuvers atop a precarious pagoda of chairs, are experts at treacherous wire-walking, and will astound with their trick-cycling, precision tumbling, somersaulting, gymnastics, and juggling. Their dexterity and incredible balancing feats showcase their tremendous skill and ability. These incredible performers are accompanied by live musicians playing traditional Chinese instruments. It’s an awe-inspiring entertainment event not to be missed! The Peking Acrobats – Saturday, March 3 at 3:00 & 7:30 p.m. Click here for tickets!